This article disseminates the results of a programme of detailed archaeological survey and archive research on one of Europe's most important surviving late-medieval Guild Chapels — that of the Holy Cross Guild, Stratford-upon-Avon (Warwickshire). Today the building is part of Stratford-upon-Avon's tourist trail, located directly opposite William Shakespeare's home, 'New Place', and visited by thousands of tourists every year. However, its archaeological and historical significance has been overlooked owing to the extensive restoration of the building in the 19th and 20th centuries. This destroyed evidence for an internationally significant scheme of wall paintings within the Chapel, paid for by the London Mayor and Stratford-upon-Avon merchant, Hugh Clopton, an important member of the Holy Cross Guild and the original builder of 'New Place'. The paintings also have an important connection with Stratford-upon-Avon's most famous son, William Shakespeare, whose father may have been involved in their destruction and removal during the 16th century. 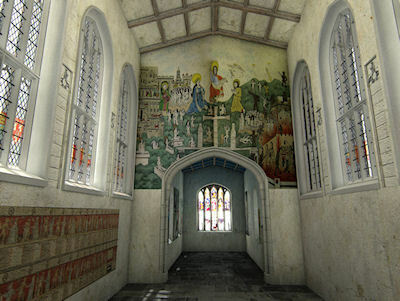 Research by a team of historical archaeologists and digital heritage specialists at the Department of Archaeology, University of York, has revealed the significance of the Guild Chapel through the creation of a digital model and textual paradata, which form the focus of this article. The project is ground-breaking in that it moves beyond the traditional use of digital models as virtual reconstructions of past buildings to use the model itself as a research tool through which the user can explore and validate the evidence for the scheme directly. This is achieved through the creation of a palimpsest of antiquarian drawings of the paintings, made as they were revealed during restoration works in the 19th and 20th centuries, and set within their 3-dimensional architectural context. The model allows the user to compare and contrast differences in the recording methods, iconographies and interpretations of the scheme. It is supported by the 'paradata' that forms the core of the article text, and which provides an innovative model for the analysis of the antiquarian records of the scheme, and their contextual meaning. The project reveals the Guild Chapel at Stratford-upon-Avon to be one of the finest examples of mercantile and guild patronage of the period, shedding important light on the patronage of ecclesiastical art on the eve of the Reformation, and revealing important connections between provincial guild architecture of Warwickshire and internationally significant schemes in London and Paris. It also provides a ground-breaking model of the ways in which digital heritage technologies can be harnessed not only by historical archaeology, but within the arts and humanities more widely.